Manage sales and purchase orders, create packages and shipments, and send delivery updates through a single order management system. Dedicate more time to growing your orders than managing them. Integrate with Amazon, eBay, Etsy, and Shopify and manage all of your online orders in a single platform. 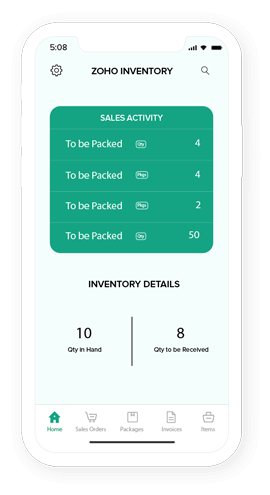 Set a reorder point and get updates on your stock level to avoid out-of-stock situations. Create packages, print package slips and get real-time shipping rates for 30 different shipping services. You can do all of this and more from a single order management system. Monitor the movement of packages after shipment and keep your customers updated on their locations. Create more satisfied customers with this order management system. Set up and integrate your payment account to start receiving online payments right away. Switch to an easy, secure, and convenient mode of accepting payments from your customers. Identify your most profitable item, or monitor purchasing and sales order trends to make informed decisions and stay ahead of your competitors. 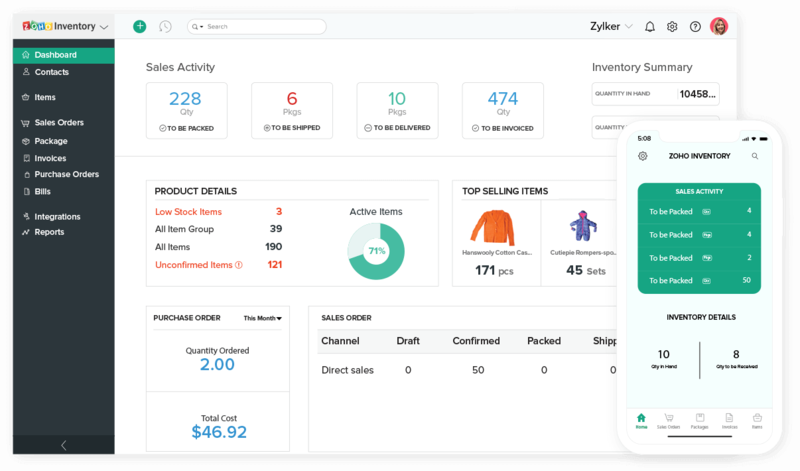 With drop shipment and back ordering in Zoho Inventory, create purchase order direclty from a sales order or have your manufacturer ship the goods directly to the customer so the order is not delayed. Bundle items together to sell as a single unit with Item Kitting. Set reorder points and get timely notification when you need to replenish your stock. Ensure that you always sell items while they are fresh with batch and expiration date tracking. Monitor and control the flow of stock between your warehouses and your stores, no matter where they are. Choose the warehouse closest to the customer at the time of sales order creation so you can deliver your order faster. Track the movement of items between warehouses with serial number tracking. Sell on multiple ecommerce channels and manage all your online orders with one platform. Transact in multiple currencies and have them converted to your base currency, automatically. Gain insights into individual channels' performance and make informed business decisions. Convert confirmed sales orders into packaging slips in just a click. Integrate with multiple shipping carriers to manage your shipments globally. Create a drop shipment to have your vendor directly ship the stock to your customer in case you are out of stock. Get relevant insights like your best-selling products and customer payment history, with sales reports. Keep track of the value of every item in your inventory with FIFO tracking. Prevent fraudulent practices, track down errors, and be constantly aware of your business activities. Go mobile with our iOS and Android app. Stay connected and get real-time updates on the order status, no matter where you are. "Named among the Best inventory management software products of 2018 by PC Mag India."